Plants may seem inert, but they’re surprisingly electrical in nature. Our photosynthetic friends are equipped with biological circuits capable of transmitting bio-electrochemical signals between tissues and organs. These signals are triggered under special circumstances, such as when the plant is exposed to light, a shift in gravity (or orientation), a mechanical force (like touch), changes in temperature, and when injured. Indeed plants may not be mobile or exhibit consciousness, but they’re armed with an assortment of tricks to help them thrive and survive. The internal transmission of bio-electrochemical signals excites the cells and tissues within plants cells, prompting certain actions or responses, such as tissue regeneration (growth), the extending of leaves toward light, or triggering a defence against threats. 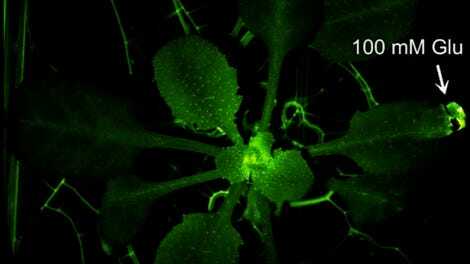 This active signal network, as the new experiment in “cyborg botany” shows, can also be used to augment a plant’s natural capabilities. 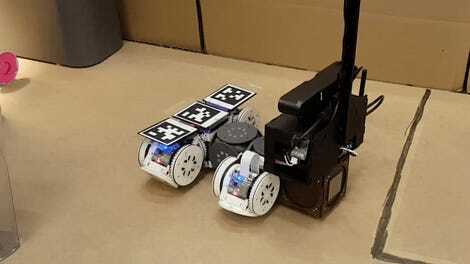 In this case, the movement of the plant is based on its internal bio-electrochemical signals, which prompt the wheeled robotic base to move toward a light source. In this proof-of-concept demonstration, Sareen and Maes placed silver electrodes into the plants stems, leaves, and root system. An interface device processed and amplified the weak signals emitted by plants, and then transmitted these signals to the robotic device. In tests, lamps were placed on either side of Elowan. The plant could sense the light coming from the illuminated side, resulting in a signal response that triggered the movement toward the light. 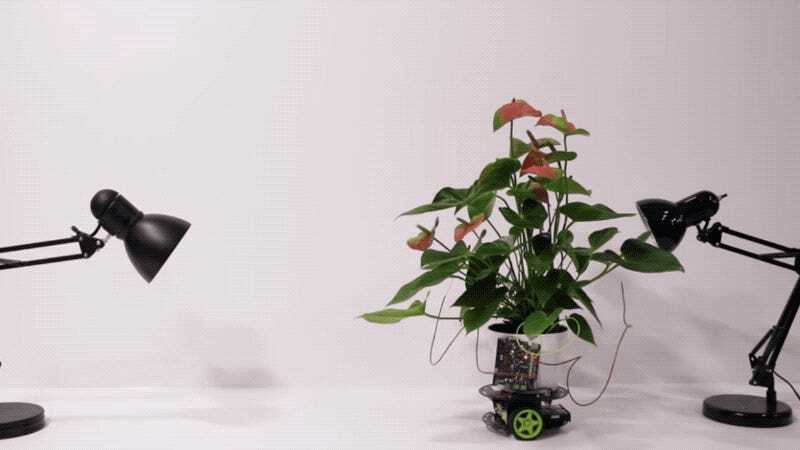 Thus, the plant-robot hybrid traveled either left or right by itself, where the “agency of movement rests with the plant,” in the words of the researchers. To be fair, the use of the term “agency” may be a bit of a stretch. Plants don’t have agency in the sense that they’re able to make decisions or exert free will. Rather, their internal circuitry and processes are being triggered by external stimuli, making them mindless automatons. The claim that Elowan’s internal circuitry is driving the process is fair, however. It’s a neat experiment, both in terms of its scientific and artistic aspects (Sareen is also a visual artist and an assistant professor at the Parsons School of Design), but the system could be expanded or modified for practical applications, as well. Part of the rationale behind the project was to leverage the natural abilities of plants as a way to augment their capabilities even further. Sareen imagines extensions to cybernetic plants that could allow them to grow and defend themselves in novel ways. What’s more, these symbiotic systems could also be used to power future electronic systems more organically, resulting in devices capable of self-power, self-repair, and self-growth. It’s all very exciting stuff—and we’re finally setting the stage for a plant-based technological singularity. I, for one, look forward to welcoming our new vegetable overlords.